Wrap up against the big chill with this cosy winter warmer and save money at the same time. 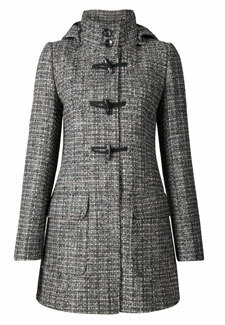 Laura Ashley have this snug tweed coat reduced from £110 to £55 when you buy online. Wear it with boots or smart trousers or jeans – in fact with anything. With its funnel neck and detachable hood it will last for many winters to come. Available in sizes 8-20. And if it’s home buys you are after, no problem as the 50% offer applies across the board. Order by the 16th December for Christmas delivery.